PERFECT WORKOUT: Premium Battle Ropes are great conditioning tools that not only improve your cardio but will provide a full body workout with a focus on improving muscle endurance and strength. It helps build core and arm strength and is excellent for burning tons of calories. ANCHOR KIT INCLUDED : Every battle rope comes with everything you need to workout anywhere quickly and easily. PREMIUM QUALITY: Our battle ropes are made from the highest quality 80% Dacron, 20% Polypropylene for durable, long lasting wear resistance that will hold up to regular workouts. Can be used outdoors and get wet. Rope material won't shed like manila ropes! PERFECT DESIGN: The best quality material available to provide the best weight to length ratio and make them virtually water, weather and shed proof! -Extra Long Handles - 10" heat-shrink grips for improved grip and protection for your hands; guaranteed to never come off. Conditioning Ropes began as a mainstay tool in Mixed Martial Arts, and then Functional Fitness. It is now used by the majority of athletes who train for power and explosiveness. The battle rope is universal because it has an ability to build core strength and improve core-to-extremity strength that helps you to hit your next workout, or opponent, hard. Power rope training is brutal in its hit to an athlete's conditioning and is an excellent developer of grip strength. I have used battle ropes in the past at other gyms for workouts but having this ELITE SRS Battle Rope brand new out of the box was pretty amazing. The blue red coloring of the ropes is pretty sharp design. The grips definitely helped me keep a solid hold during the workout. The main thing with having these as a personal item is having the space to extend them out and something sturdy to loop it around. Personally I used the anchor kit in my garage gym and strapped it around my power tower. I believe that battle ropes are a great addition to any home gym and creates versatility in my workout routine. It may seem simple but battle ropes are as challenging as you make them. If you push yourself and get creative you can achieve a great cardio workout that will also leave you with your muscles burning. As you can see the ELITE SRS Battle Rope is about HALF the price of other comparable ropes from other big brands, and this INCLUDES the anchor kit! 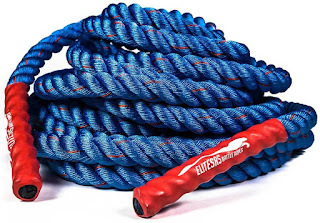 This is a crazy awesome value, This rope also doesn't fray/shed like the competitors either (Rogues will fray a lot without their $250 rope sleeve combo). I have been using this rope for several weeks now and have not noticed one strand out of place! If you are in the market for a rope...this. is. it. The ELITESRS Battle Rope has given me some great high intensity work outs that I like to pair together with either explosive movements involving weights, or moderate paced cardio in between rounds. What I love about these ropes is that you can really target any body part that you want to if you focus on that muscle group. This is the perfect cardio for those who hate the normal jog or elliptical session, and it allows you to really attack your muscles while burning massive calories throughout the rest of the day. 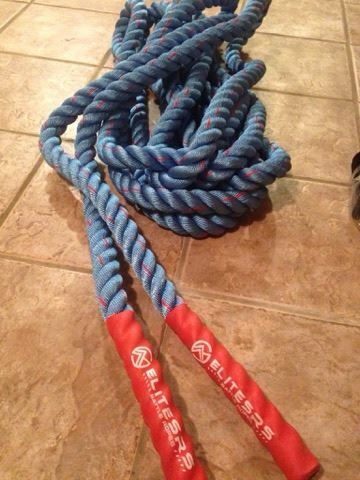 The quality of the rope is perfect, handles have a great texture and are easy to hold onto even when sweaty. I couldn't recommend this enough if you're in the market for one!